The foundation, launched in July 2015 with a $30 million commitment to improve the caliber, effectiveness and availability of amateur baseball and softball programs across the United States and Canada, also announced a partnership with Positive Coaching Alliance for the training of coaches and administrators from the Reviving Baseball in Inner Cities (RBI) program. 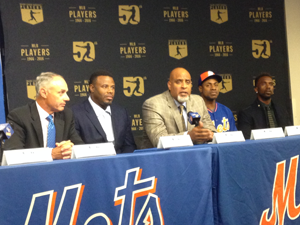 The series of announcements were made by Players Association executive director Tony Clark and MLB Commissioner Robert D. Manfred, Jr., along with McCutchen, Granderson, Franco and Grissom. •Brooklyn Bonnies Youth Club, a year-round, sandlot youth program that uses baseball as a vehicle to guide kids to success in high school and college. Positive Coaching Alliance, a national non-profit developing "Better Athletes, Better People" through youth and high school sports has already started delivering its Double-Goal Coach® workshops to RBI coaches. The program explains why and how to pursue winning and using sports to teach life lessons to youth. PCA also is providing its workshop, titled "Leading Your Organization: Developing a Positive Coaching Culture," to RBI local administrators. The partnership between PCA and MLB/MLBPA will set out to train and certify every RBI coach as a Double-Goal Coach over the next three years.